These are recent pictures of the stainless steel objects found in the tunnel. The top faces of the two stainless steel disks. 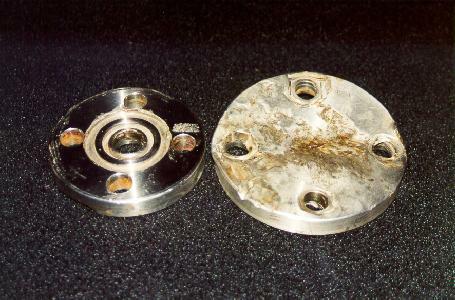 Note the extreme damage to the right-hand one. The one on the left seems to be some sort of bearing housing, as shown by the circular indentations. 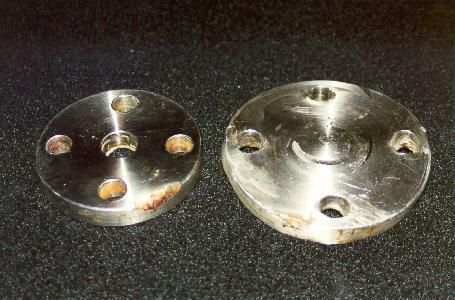 The bottom faces of the two disks. 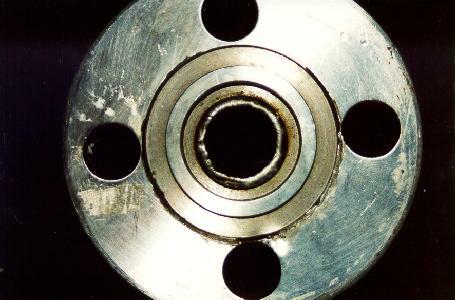 The theory that these were bearing housings is also reinforced by the circular wear marks near the center of the right- hand disk. 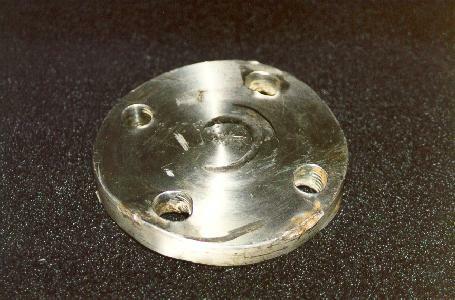 A view of the top of the smaller disk, with a tape measure for comparison. 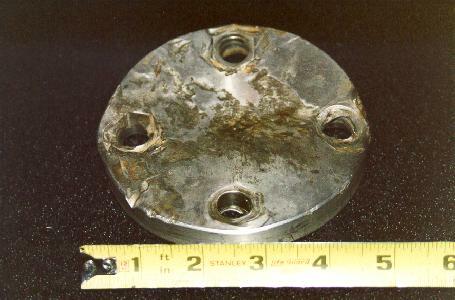 The disk is 3 7/8" in diameter and 9/16" thick. The mark at 3 o'clock on the disk is where some double-sided foam tape was removed (I used this object as a paperweight with a pen attached to it at a job I had in the late 1970's). 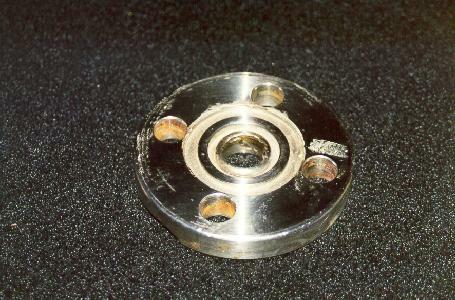 Another view of the same disk. A closeup of the top of the disk. A view of the bottom of the smaller disk. 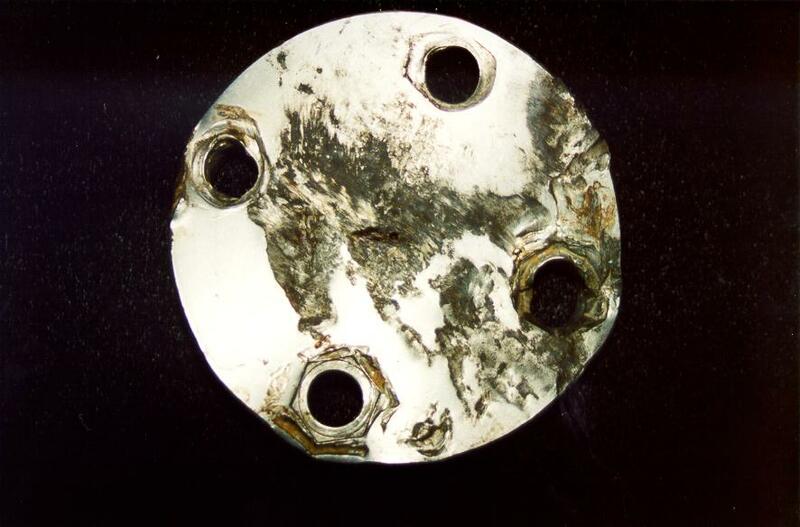 The only apparent damage to this disk is the piece ripped off the lower edge and the resulting rough surface. The holes at 1, 4, and 7 o'clock show some minor abrasion, but I think this was normal wear and tear, not damage. A closeup of the damaged area of the disk. 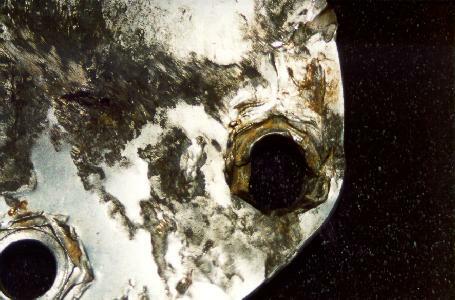 A view of the top surface of the larger disk, with the tape measure again for comparison. This disk is approximately 4 3/4" in diameter (it is hard to be exact because of the way the disk is deformed) and is 9/16" thick, the same as the smaller disk. 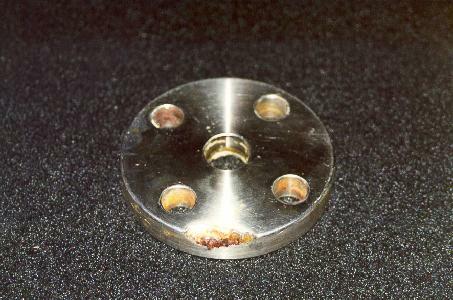 Another view of the top. 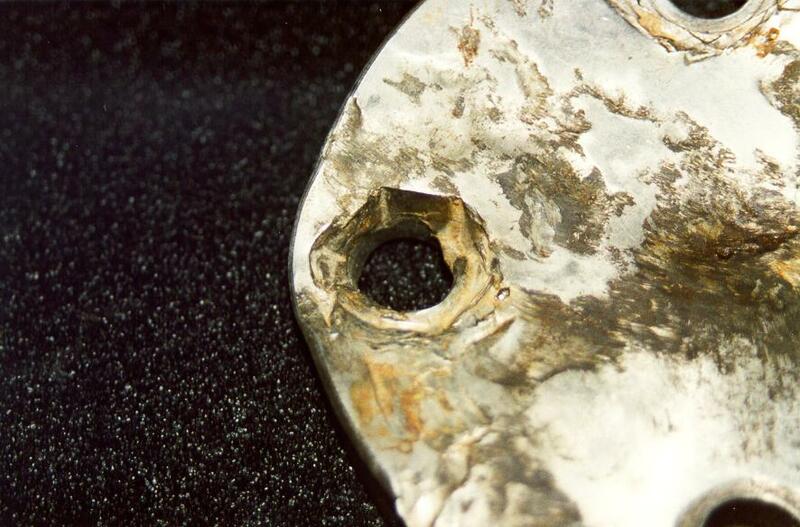 Note that the metal is deformed where nuts were pulled into the metal. It must have taken an incredible amount of force to do this - if I hit one of these disks with the other, striking on the edges, I can't even make a mark on either of them. 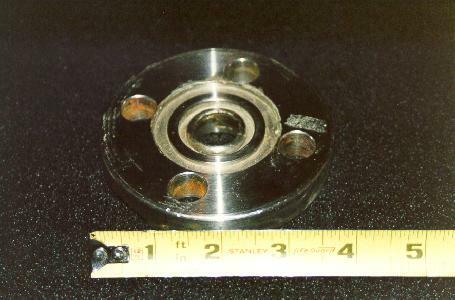 A straight-on view of the top of the disk. 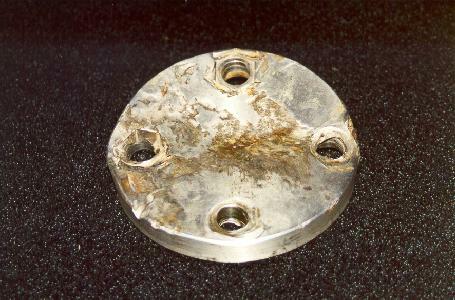 The bottom of the larger disk. 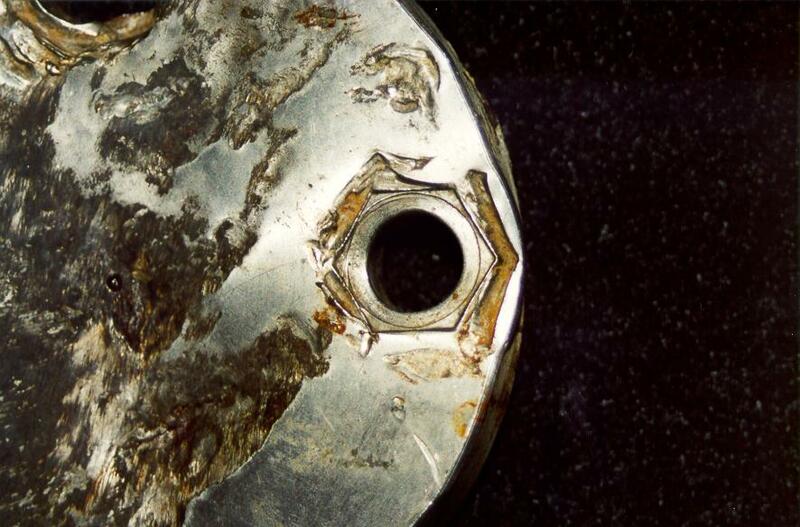 At 4 o'clock, you can see the marks left by the bolt that used to go through the hole. 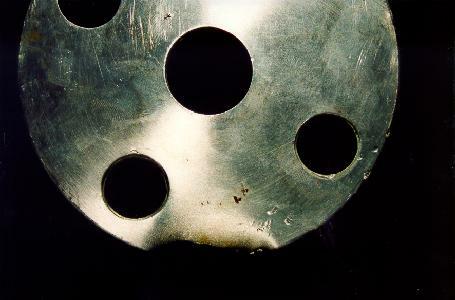 And all of the holes are deformed well out of round, almost as if the metal was stretched. A closeup of one of the holes. Click here to return to the main Pompton Powder Works page. Accessibility Policy This page last modified on Monday, 02-Nov-2015 23:33:32 EST. So, what's a glaver anyway? 3 hits this week, 8227 since 2/18/2000.